GDPR is around the corner. Are you Ready? Take our GDPR Readiness Assessment to find out. Start the survey. 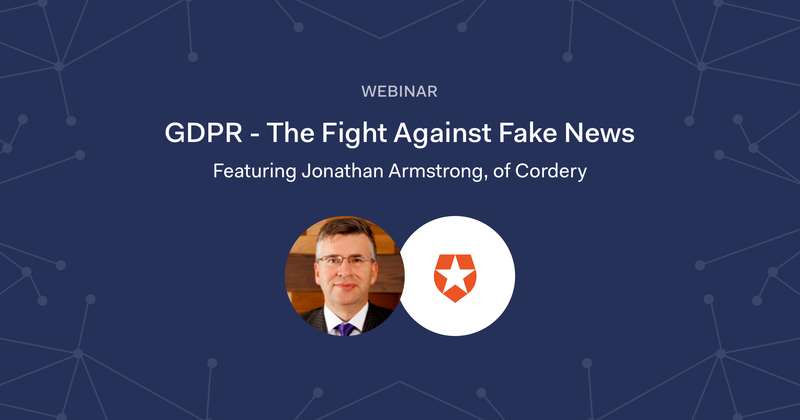 With the General Data Protection Regulation (GDPR) set to come into force May 25, 2018, Jonathan Armstrong, technology and compliance lawyer with Cordery, hosted a webinar with Auth0 to discuss and clarify the truths behind rumors and misconceptions regarding GDPR and what it means. Since the announcement of GDPR, fake news has been circulating about the upcoming EU data privacy regulation. False rumors have been perpetuated in webinars or at events. Such misconceptions can cause major issues for organizations. For example, if the CFO of a financial institution is told that GDPR doesn't apply to financial services, budgets can be substantially withdrawn due to misinformation. To read an introduction to GDPR and how it affects businesses and organizations, please check out Get Ready for GDPR. You can also go here to read the regulation itself. All of the above are inaccurate, and Jonathan Armstrong explains why in the webinar. He also responds to several more fake news items that have been circulating since the announcement of GDPR. With GDPR approaching enforcement on May 25, 2018, it's more important than ever to be knowledgeable about the regulation and its impact. In addition, learn how organizations can benefit from improved business processes in their preparation for GDPR. Don't be fooled by GDPR fake news: get informed by checking out the webinar below. I am the Manager of Community & Technical Content for Auth0 and a Google Developer Expert in Angular. I'm passionate about identity, authentication, and the developer community. I love teaching and learning from and sharing with other developers. I'm an international speaker and enjoy running workshops at tech conferences around the world.